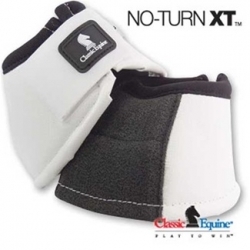 Perfect for hardworking sports the Classic Equine No Turn XT Bell Boot with Kevlar is durable with a non-rip vinyl cover for long life. Back panel is covered with a bulletproof material for added protection and durability and shock absorbing nitrate center guards against the toughest blows. Kevlar is durable with a non-rip vinyl cover for long life. Guards against the toughest blows.